Why “The Client Sets The Agenda” May be Killing Your Coaching Business - Coach & Grow R.I.C.H. Did you learn that too? At the time it made sense to me. …Simply “letting the client set the agenda” didn’t always work out that well. Some clients really liked to hear themselves talk and wanted to spend the majority of the coaching session debriefing or going off on tangents. And while this made them feel better in the moment, they weren’t experiencing the kind of transformation and results I knew were possible. Other clients were more quiet and reserved. It wasn’t long before I realized that if I didn’t help steer the bus, the client wouldn’t get very far. Have you ever experienced these things coaching your clients? …Creating my signature coaching system and packaging up my coaching into a structured coaching program. => No more feeling like you are “winging it” as a coach. Instead you’re confident because you have a structured process to help keep your clients stay focused, accountable, energized and on-track towards achieving their goals. => You sell more coaching sessions and make more money. Packaging up your coaching into a structured program that you deliver over a set period of time increases your overall revenue, makes your monthly income more steady and essentially eliminates having clients wanting to quit after just a few sessions. => Your clients totally love you because they’re getting great results fast. Having a structured system makes you a better coach and helps you best support your coaching clients in achieving what they really want as quickly and easily as possible. If you aren’t experiencing these things in your coaching business yet, let’s change that! This week I’m offering a one-time-only pilot Virtual Workshop where I’ll be walking a group of coaches through creating their Signature Coaching Program in a single day, at a fraction of the regular investment. Virtual Workshop: Create Your Signature Coaching Program in just 1 day! => Seriously increase your income by signing up more clients for longer periods of time. 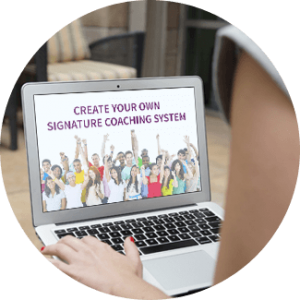 Join me and enjoy a 70% Savings on this one-time only pilot “Create Your Signature Coaching Program” Virtual Workshop. Click here -> Create Your Signature Coaching Program: One-Time Only 70% Savings. This highly experiential “Get It Done” Virtual Workshop is happening this week and space is limited, so if you want in, don’t wait. You get the video and audio recordings so that you can choose a time to go through the virtual workshop when it works best for you. All of the workshop materials are yours to download and keep so you can add them to your personal Business Success Library. You get a follow-up group coaching call where we’ll review and fine-tune your Signature Coaching Program. You can ask questions and receive feedback in our private Facebook Group. Create Your Signature Coaching Program 1-Day Virtual Workshop <= Get the details and register now. Space is limited and it’s happening soon!